I completed development of the Alauda driver in September and submitted the driver for inclusion to the Linux kernel. The driver duplicates some code (checksum, media ID table) which is also present in other drivers, and it looks like we want to figure out a good way to share this code before including my work, which is a fair point – we don’t want to duplicate this yet again. For now I’m publishing my driver as a standalone patch which people can use until we figure out the real integration details. These devices seem to be more common than I originally thought. Patch available here (against Linux 2.6.14). In true open-source style, a group of hackers have taken my work and used it for something I didn’t design for: hacking the Juice Box – a portable media player based on ucLinux. From what I gather, these devices boot from a small amount of NAND flash. 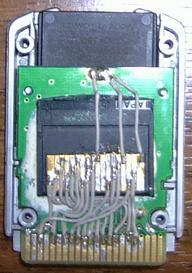 To customise the device to a decent level, you need to replace this flash with your own. However, you can’t just pre-program these XD cards on any old reader/writer. You need to use a device which gives you access to the physical block layout of the media, so that you can write to block 0 (amongst other things). Almost all XD reader/writer devices on the market handle physical block translation in hardware, and only provide a logical block interface to the host operating system, which does not satisfy the needs of these hackers. The Alauda is probably the most common device that provides physical access, making writing a driver considerably harder, but allowing you to hack the media in ways such as this. I may even donate my spare Alauda device to their project. This entry was posted on Tuesday, November 8th, 2005 at 8:40 pm	and is filed under Gentoo, Linux kernel. You can follow any responses to this entry through the RSS 2.0 feed. You can leave a response, or trackback from your own site. Hello, I’m one of the Juicebox guys. I’ve got two MAUSB-10′s in my hands from closeout, and would like to do direct writes. Any reason I could not have both online, and use dd to/from the device files to image one XD to another? If it won’t support two MAUSB’s, then I guess I could dd from the reader to a file, then back to the reader as a 2nd step. And reason raw device access would not work? Thanks for working this driver out, I look forward to playing with it. That won’t work, it’s not raw media access, even with dd you are still only addressing it logically. The current Linux driver provides no physical access.